Foundation Nimba, Centre Nimba, What does Centre Nimba do? home > centre nimba > what does centre nimba do? At the centre, 80 students with a handicap receive at least four years of education. They do not only learn the basic skills like reading, writing, arithmetic and French. 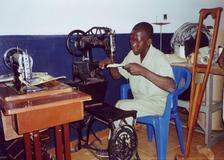 They also receive vocational training, like tailoring, shoemaking, dying fabric and needle work. On top of that, Centre Nimba takes care of the transport of pupils to and from school and a hot meal at lunch time. After finishing their education, the former pupils are supported by manager Mama Doumbouya and the teacher for at least a year. Centre Nimba consists of a school house and a main building. The school house contains three class rooms, at ground level. On the first floor it harbours an office and a guest room. The main building is used for commercial activities. The proceeds are used to help pay for the education of the pupils and the exploitation of Centre Nimba. At this moment we are realising a new practical training room. 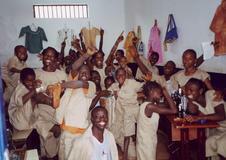 Centre Nimba now has a capacity of forty students. When the practical training room is finished, we probably can take in some more students. However, this will increase the operating costs. Not only will we need an extra teacher and a second driver, we shall also need more school supplies, meals, petrol, etc. Due to the high money inflation in Guinea, it is very difficult to financially plan ahead. Fortunately however, we were still able to give Nimba's staff a rise.